It didn't take long for me to get unpacked and settled into my new office. My desk is set up so I get to keep an eye on the southern sky while I work, and I have caught myself watching the clouds on a few occasions. It's amazing how much having a window in your office can improve your day. 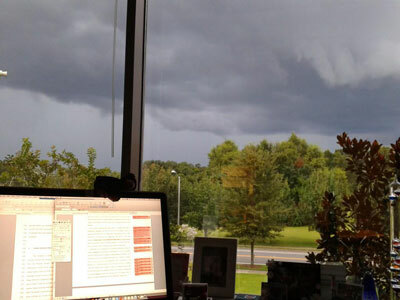 About a week after we moved in to the office, all productivity came to a halt as the sky darkened. I stopped editing a paper, sat back and watched a wonderful Florida thunderstorm roll through town, with some impressive lightning. Suffice to say, I love my new office! In the next few weeks, I will begin sending out certificates for those observers who started in 2008 and have continued to be active to the present. I did this last year, and it was amazing that I had to send out over 200 of them to Florida CoCoRaHS observers. I realize that it is just an electronic file, but it is just another way for me to express my appreciation for the dedication that you all give to this program on a daily basis. I'm not sure how many I will be sending out, but I hope to have them all delivered by the end of October. Rainfall totals across the state varied in August (Table 1). Portions of the Big Bend, Panhandle and the west coast of Florida recorded up to 8 inches above normal precipitation, while portions along the east coast from Titusville to the Keys, including most of Dade and Monroe counties, had up to 5 inches below normal rainfall (Figure 1). The additional rainfall this summer has prompted releases of Lake Okeechobee to alleviate stress on the Herbert Hoover Dike, but the releases are also being blamed for the red tide that killed 133 manatees near Fort Myers and a toxic algae blooms in the St. Lucie River. 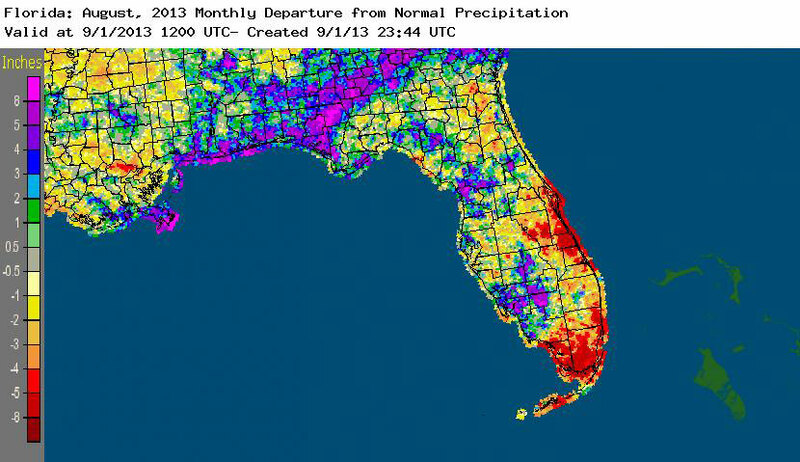 July 2013 was the driest on record at Vero Beach and 8th wettest on record in Tampa. 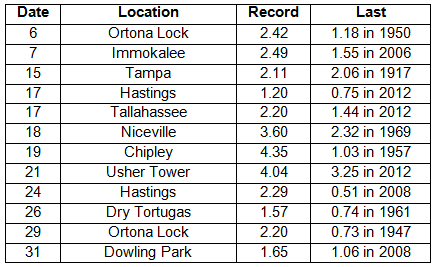 Numerous 24-hour precipitation records were broken for the month (Table 2). Table 1: August precipitation totals and departures from normal (inches) for select cities. Table 2. 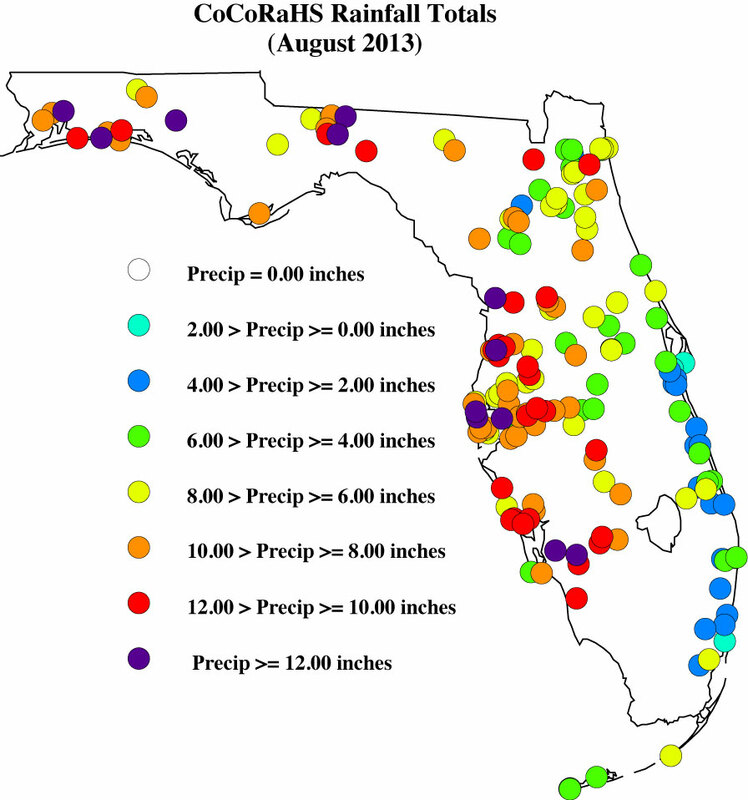 Select daily rainfall records (inches) broken during August (compiled from NOAA, NWS). 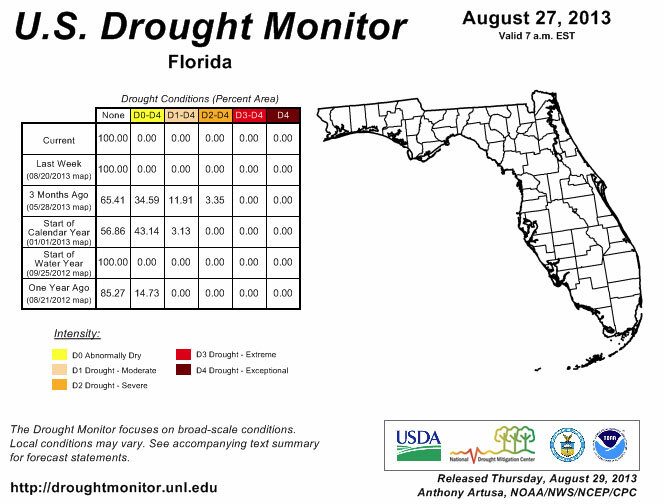 Despite below normal rainfall in portions of the state during August (Figure 1), Florida remained drought free since July 9th. September marks the peak month for tropical activity in the Atlantic and, should a hurricane or tropical system track toward the state, impacted areas could see above normal precipitation. Water levels in Lake Okeechobee are about 15.5', which is the highest level the Corps will allow during the hurricane season. The Herbert Hoover Dike, the 25'+ tall, 143-mile long gravel, rock, limestone, sand and shell dike built in the 1930s, is being watched closely as it is vulnerable to leaking and failure when the water levels get too high from heavy rains. In addition to the concerns about Lake Okeechobee, rivers in the northern part of the state have been at or above action stage during August. The saturated ground has lead to extreme run off, filling rivers to their banks. Fall is typically a drier season for the state, however, with the unusual weather patterns seen this summer, it's difficult to say if precipitation will be normal despite the fact that the three-month outlook (Sept-Nov) from CPC shows average rainfall across the state. August brought more flagged rainfall reports. Some were valid, though there are a few outstanding issues that need to be resolved. I appreciate how understanding the contacted observers were, along with how quick they were to reply to my emails, though there are a few outstanding issues that need to be resolved. Please remember: if you receive an email from me with the subject line 'Question About Your Recent CoCoRaHS Observation', please take a moment to answer me back. And if you have any questions, please feel free to contact me.